So what would happen if you shaved, dusted off, and cleaned up the members of ZZ Top, gave them state-of-the art equipment, english accents, and locked them in a room for a month with nothing to listen to but Actung Baby and Pop by U2, Fat of the land by Prodigy, Some Kiss Albums, Moby, Flatboy Slim, Robert Palmer, and even KC and the Sunshine Band. 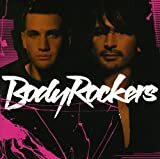 The result would be this album by the Bodyrockers. While at times it has some really cheesey 80s clich� sounds in it, it never loses sight of making you want to dance and be happy and horny. This is a great mindless album to not think to, an album that your mind can take a break on, and that your body can just get up and cut some rugs. This album will surely become a lot of people�s guilty pleasure.